Top 4 gainers on the Sensex include SBI, Tata Steel, GAIL and Coal India which were up between 0.5-4%. The benchmark indices have started the week on a dismal note, reversing gains in the two preceding trading sessions, due to fears of below-par monsoons and lingering uncertainty over key reforms such as the derailed GST Bill. However, there was a frenzied buying in PSU banks after the government announced a plan to revive the state-owned banks, including a Rs 20,000-crore capital infusion lifeline and induction of fresh talent, and this capped the downside. 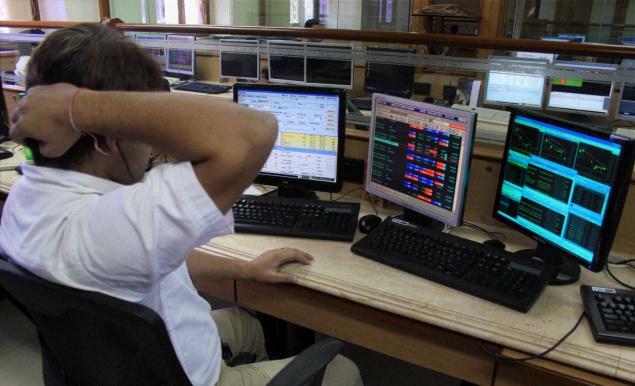 The Sensex oscillated in a range of more than 300 points between a low of 27,739 and a high of 28,095 before ending below the 28,000 mark at 27,897, lower by 170 points and Nifty settled at 8,482, down 37 points. The broader markets, however, bounced back into the green, with the BSE mid-cap and smallcap indices gaining 0.3% each at 11,488 and 11,791 respectively. And the BSE market breadth was marginally positive, with 1,442 stocks advancing as against 1,426 declining stocks. The rupee has hit 2-year low and is trading 21 paise lower at 65.21 against the US dollar on sustained bouts of dollar demand from importers amid weakness in equities. The monsoon rainfall deficit has widened to 10% as a strengthening El Nino weather pattern trimmed rainfall, the weather department said, raising fears of the first drought in six years. The June-September southwest monsoon is critical for India's agriculture as a considerable part of the country's farmland is dependent on the rains for irrigation. Cipla, Hindalco and ONGC shed 2-4% each to emerge as the key losers during the day. RIL and ONGC, with losses of around 2% each, also dragged the indices lower. On the other hand, Tata Steel, SBI and Gail were among the key heavyweight gainers on the BSE. On the sectoral front, the oil sector was the top sectoral loser on the BSE, while the banking and metal space bucked the weak trend. In the oil space, Reliance shed nearly 2% on a further decline in the crude price as a global glut of crude supplies showed no signs of abating in the face of sluggish demand. ONGC declined by 2% to hit 52-week lows after the company reported net profit of Rs 5,460 crore for the quarter ended June 30, 2015 (Q1) against an average analyst estimates of Rs 6,029 crore. PSU OMCs, including IOC, BPCL and HPCL, have surrendered their early gains and now trading lower by about 1% each. The OMC had risen this morning after a reduction in petrol and diesel prices with effect from 15 August 2015. On the other hand, the PSU banks were buzzing in today's trades after the government announced a revamp plan for PSU banks. The government on Friday unveiled a seven-pronged revamp plan to help struggling state-run banks, including a Rs 20,000-crore capital infusion and hiring of private sector talent. SBI zoomed by 4% at Rs 279 to top the gainers list on the BSE on the back of the reform measure and the bank's decision to cut rates on deposits of certain maturities by 25-50 basis points. In the larger banking universe, Bank of Baroda surged by 15% at Rs 212, while Canara Bank, Bank of India, IDBI Bank, PNB, Allahabad Bank and Oriental Bank of Commerce rallied by upto 10% each. Metal stocks also had a good session, with JSW Steel zooming by 7%, and Tata Steel and Nalco gaining about 3% each.